Ever since OLPC tried to bring cheaper portable laptops around the world, there has been a steady stream of low level devices with one primary goal – get users online at a low price point. 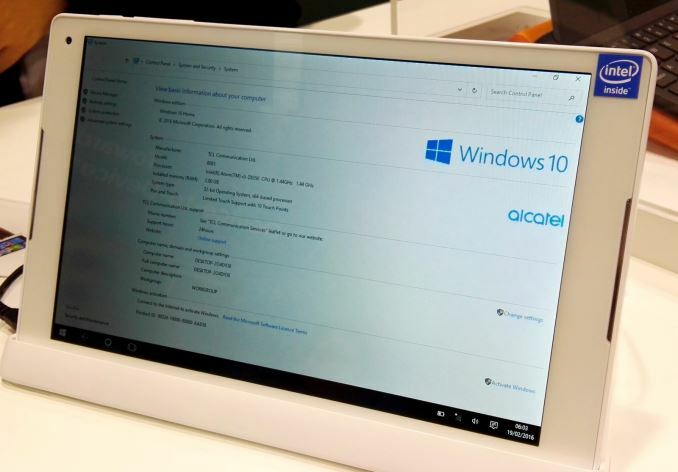 So while Mobile World Congress has been talking a lot about super high end devices and smartphones, alongside Alcatel’s launch of the Idol 4 and Idol 4S they are also launching the Plus 10, a new Windows 10 2-in-1 tablet. The tablet houses the hardware – within the 10.1-inch IPS panel running at a 1280x800 resolution there is an Intel Atom x5-Z8350 SoC (quad core 14nm Cherry Trail, 1.92 GHz) with integrated HD 400 Graphics (12 EUs, 500 MHz), 2GB of DRAM, 32GB of internal storage which can be expanded via a 64GB microSD card, and a 5830 mAh battery. 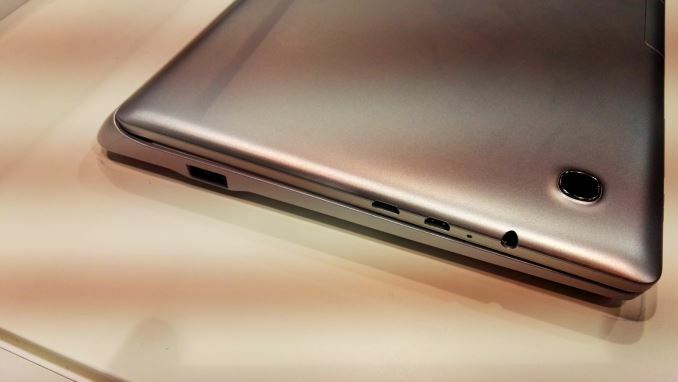 The tablet has some minor IO: USB, micro-USB and micro-HDMI, but the keyboard gets a full-sized USB Type-A and a couple of other ports. 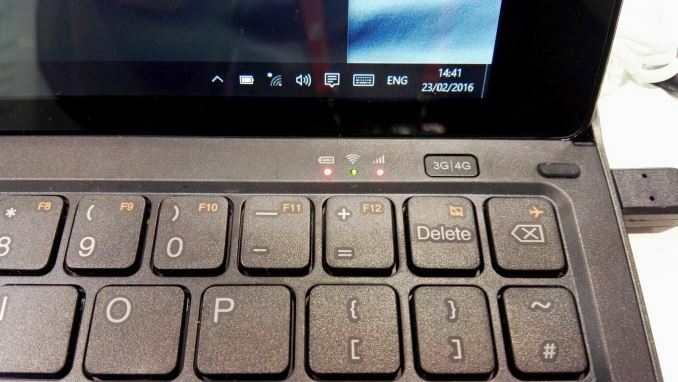 The keyboard also adds another 2590 mAh battery, but the whole unit is Cat 4 LTE capable, supporting up to 150 Mbps, and the keyboard can act as a mobile hotspot for up to 15 users. We were able to get some hands on time with the device, and despite the fact that none of the keyboards seemed to work when installed, it came across as an easy to use tablet. Obviously touch on Windows isn’t the best experience without dedicated software, but the screen seemed bright enough when head-on and if the keyboard worked it could make an easy working experience. 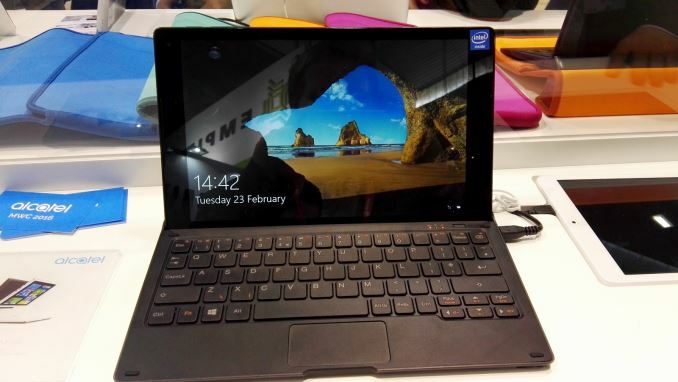 Because the device is a 2-in-1, the tablet and keyboard detach – the tablet can face either direction, making it easy for the keyboard to face away and act as a stand. Another issue was when closing the tablet into the keyboard – because of the rigid lip on the keyboard end where the two connected, there wasn’t a good connection. Andrei pointed out that one magnet was weak (perhaps it was a demo model) but it went beyond that, it was clear that the two parts didn’t even line up, and I doubt they would stay together when being carried like a 2-in-1 is normally carried. One thing worth noting in our examination is the use of 32-bit Windows 10. This might go some way of explaining the 2GB DRAM installed (most likely single channel as well), but might have repercussions for software compatibility and performance. The Wi-Fi module wasn’t listed in the official press release, but we found it listed in the system manager as the Realtek RTL8723BS, which is an 802.11n part which is limited to single stream 1T1R 2.4 GHz operation, making it a very cheap option to use. We were told that the device will retail for around 259-269 Euros, which makes it a sizable and interesting upgrade from something like the HP Stream 11 series of clamshell devices, albeit with a few obvious flaws (at least on these units). I have a feeling these might end up in an educational context as one of the primary markets, alongside sales to end-users. 260€ european price is pretty cheap considering this is a full-fledged computer and surface book-like convertible. maybe I'm out of the loop a bit, still it has features not usually offered on cheap laptops. 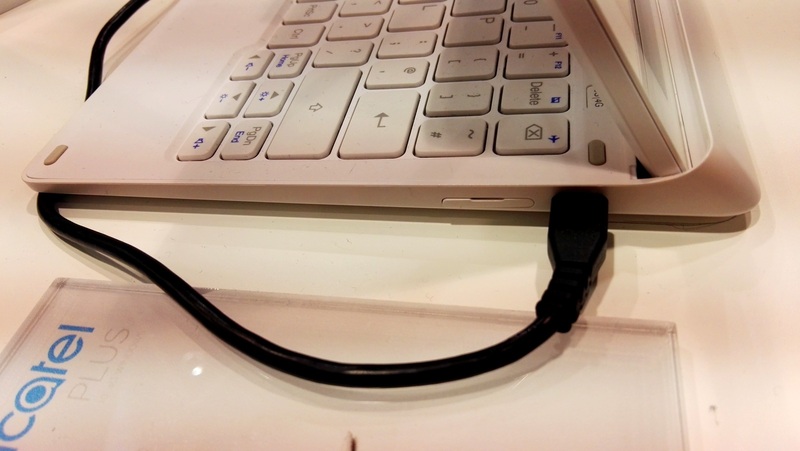 "the detachable screen/keyboard combo is a disaster in educational environments"